Rejoice! The lockout is over. Teams now have only a short period of time to get their rosters settled before a sprint to the playoffs. And you only have a short period of time to get pumped up for hockey's glorious return! I know you've already forgotten all about your empty promises to never watch hockey again, so what better way to get ready than to read the five reasons to be optimistic, pessimistic, and realistic about the 2013 Toronto Maple Leafs. The Leafs finished 10th in goals last season and added James van Riemsdyk in the off-season. Sure, his career goals per game pace produces slightly less than 20 over a full season, but he's a semi-recent second overall pick, and if you can't get optimistic about that then you really aren't a true (delusional) Leafs fan. It should be noted that the Leafs finished between 9th and 11th in scoring the first four years after the lockout and never made the playoffs either. Sorry, trying to be optimistic here and it clearly isn't working. I'll try again. Goals! We got 'em. Unlike other teams that spent wildly this off-season, the Leafs will have themselves some cap space (currently $6.7 million, although that is subject to change based on who makes the team out of camp). The Leafs also have a bunch of dead money coming off the books after the season ($8.25 million between Tim Connolly and Matthew Lombardi alone), giving them flexibility in resigning Joffrey Lupul and/or going after some of the big name free agents (i.e., Corey Perry and Ryan Getzlaf). Every rumour has the talented netminder coming to Toronto once the lockout ends. That would give the team the first real stability (disregarding James Reimer's non-concussed stint) in what feels like a century. In between the lockouts, Luongo was fifth among full-time starters in save percentage (.919), second in wins (259), third in games played (461), 11th in GAA (2.45), and third in shutouts (37). He's elite. With Luongo, the Leafs transforms from a lottery team into a potential playoff contender. But if the Leafs don't land Luongo... well, just wait until you get to the Reasons to be Pessimistic. Over the past seven years, two to three teams that make the playoffs one year fail to make it the next. The top teams in the East—New York, Boston, Pittsburgh, Philadelphia—should still be good, but there is less certainty among the other four playoff teams from last season. Florida: The Panthers were last year's three seed, despite finishing with only one more regulation/overtime win than the Maple Leafs. The only difference between the two teams was the Panthers' ability to win a couple extra times in the shootout and gain eight additional loser points for overtime losses. Additionally, the Panthers owned the worst goal-differential of any playoff team since the 1996-97 Montreal Canadiens. There is definitely some regression in order as playoff teams with a negative goal differential have missed the playoffs the next year 60% of the time in between the last two lockouts. New Jersey: On average over the last seven years, teams that lose in the Stanley Cup final drop six points in the standings the next year, something which should not comfort Devils fans. Dropping from 102 to 96 points would still make the Devils a playoff team, but they lost their best two-way player, Zach Parise, have four of their top 10 scorers older than 34, and have an old Martin Brodeur in net, making a six-point drop seem conservative. Washington: The Capitals lost offensive firepower in the way of Alex Semin (although he was trending down) and Dennis Wideman (although he can't play defence), replacing them with... Joey Crabb and Wojtek Wolski. A healthy Nicklas Backstrom could be a cure-all, especially for Alex Oveckin's puzzling, rapid decline, but this team looks like a shell of the Eastern Conference powerhouse they were a few years ago. Ottawa: I never saw the Senators being good last season and I'll be damned if I see it now. What's that? They have a No. 1 centre, defenceman, and goalie? Shut up, observation! That makes four attainable playoff spots (or three if I begrudgingly include the Sens in the quality teams category). Massive improvements to Carolina likely make them a playoff team, but no one else took a huge step forward in the off-season, making Toronto's competition with other bad teams less fierce. The Leafs fell apart last season after 53 games, going 7-18-4 down the stretch. Well, that shouldn't be a problem this season because there won't be more than 50 games. If there's no Luongo, what version of Reimer will be taking over the No. 1 duties? If it's Concussy McMush-head, say hello to the lottery. James Reimer pre-concussion: 43 games, .920 SV%; James Reimer post-concussion: 28 games, .898 SV%. Just for fun, here's some more pessimism: Reimer's monthly save percentage in his career is 1.000/.932/.926/.913/.909/.912/.895/.857/.901/.905. I don't like that trend line. Besides trading for James van Riemsdyk and signing Jay McClement, the Leafs had a very quiet offseason. JVR should help with secondary scoring—a major concern if Nikolai Kulemin can't rebound or Joffrey Lupul and Phil Kessel regress—and McClement should help on the penalty kill (he certainly can't make it worse), but it is unlikely that either move is the secret to finally making the playoffs. The team's most pressing needs went unfilled. The Leafs failed to land a No. 1 goalie, a No. 1 centre, and made no improvements to a defensive unit that was already near the league basement in goals allowed. Any improvement will have to come from within (barring a Luongo trade). Nazem Kadri, James Reimer/Ben Scrivens, Korbinian Holzer, and Matt Frattin are the youngsters tasked with improving a lottery team. That doesn't inspire confidence. How is this still an issue? The penalty kill ranked third last in the league at 77.3% in 2011-12, which is somehow even worse than the year before. Not even random variance can make this horrible penalty kill improve. There's no use beating a dead horse here. This is the second biggest concern next to the goaltending. If the Leafs don't find a way to limit the damage short-handed, they won't make the playoffs. It's really that simple. 4. Where them goals at? Once Randy Carlyle took over and pointed out the defensive zone on a map, the Leafs suddenly lost the ability to score. 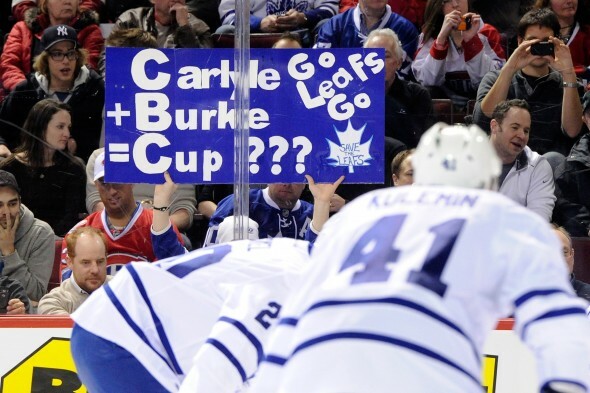 With Carlyle, the Leafs dropped from 2.98 goals per game (fourth in the league) to 2.22 (29th in the league). Was the Leafs' early season goal-scoring binge a mirage? The product of having absolutely no defensive responsibility? Some of the blame can lie with the power play, which went amiss during the latter part of the season, thanks in no small part to John-Michael Liles' concussion. With Liles at the beginning of the year, the Leafs power play was a scorching 20.32% (top 5 in the league). The unit dropped to 18.86% when Liles missed time with a concussion (still top 10 in the league), but plummeted to 15.38% once Liles returned from injury and played like he just had a concussion (bottom 10 in the league). The Leafs haven't made the playoffs since 2004, and under Burke have been more likely to wind up in the lottery than anywhere near the playoffs. Last year the team looked like it was on its way to becoming a quality group, getting everyone's hopes up, then crashed horrifically. Until the Leafs are actually in the playoffs, be extremely guarded. Even if up 10 points on the last day of the season don't rule out an asteroid hitting Earth. The Leafs are once again one of the youngest teams in the league, and although that comes with growing pains, it can also be of benefit during a lockout year. If the league tries to cram as many games as it can in as little time as possible, young, fresh legs should be the ones that are able to handle the abuse. Last season, Phil Kessel scored the most points by a Leaf since Mats Sundin notched 83 in 1998-99. Joffrey Lupul, despite missing 16 games, had a career year with more than a point per game, and finished just outside the top 25 in points. And Dion Phaneuf had his best season as a Maple Leaf—he notched his highest point total since 2008-09 and rediscovered the physicality that made him one of the league's most feared defenceman. Three strong contributions from three of Toronto's best players and the team still finished in the lottery. If Toronto hasn't found an answer in net and any of those three tail off this season, cue the arguments over whether Nathan MacKinnon or Seth Jones should be used with the first overall pick. The Leafs only had five roster players playing overseas, while some Eastern Conference teams had as many as 11. The Leafs aren't too far off from the average in the East (6.5 players), but will still be one of the rustier teams. There will be some help from the farm, but most of the players are complimentary pieces. Jake Gardiner is a lock to be with the big club (whenever he overcomes his "whiplash"), and there is a case for Nazem Kadri, Matt Frattin, Korbinian Holzer, Paul Ranger, and Mike Kostka as well, but the team as a whole won't be as battle ready as some of the clubs they will be fighting for a playoff spot. For a team that is already going to have trouble making the playoffs, starting with fewer players in game-ready condition will be trouble. Conversely, maybe starting with fewer players who played overseas and in the minors will be a blessing in disguise. Perhaps the Leafs will avoid some injuries (nagging or major) that may limit some other squads. With a short season a lot of wacky things can happen. Phil Kessel shooting 25 percent? Sure, why not. Dion Phaneuf playing like a Norris Trophy calibre defenceman? I've seen stranger things. How about a Brian Elliott season from Ben Scrivens? Anything is possible. If Donald Audette can score the second most game-winning goals in the lockout shortened 1994-95 season then surely someone like Clarke MacArthur can be among the league leaders in some category. Essentially, with no time to regress to the mean there will be absolute chaos and the laws of the universe will be rendered obsolete. Muhahahaha! Sorry, felt like that sentence deserved a maniacal laugh. You're a Leafs fan, if you're being realistic about the season you aren't trying hard enough.